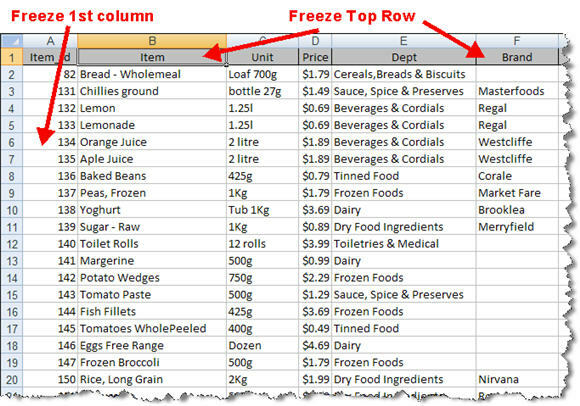 The following video tutorial shows you how to create and freeze panes of a spreadsheet window to fix in place the header row so that it is always visible when you scroll up and down. This video also demonstrates that the technique can be used to fix in place one or more columns so that they are always visible when scrolling left or right. This technique of freezing panes is extremely useful, virtually essential, for dealing with large spreadsheets such as databases. The video shows fixing both header row and columns on the left at the same time. However, you can chose to fix just the header row, or the first column on the left if that preferable. The following illustration provides an explanation of what is meant by "header row". This is the row at the top of the spreadsheet that usually contacts labels for each of the columns of data. The following download provides the same spreadsheet as seen in the video tutorial for practise of the Freeze Panes technique.